Take for instance Melbourne beach and it’s wide array of resorts and hotels. Many of the hotels offer beach-side areas specifically designed for wedding ceremonies. These venues can comfortably accommodate a couple to a few dozen guests for a beautiful ocean side ceremony. Best of all, the ceremony, the parties and meals as well as the place where everyone stays is all at the same location. Your guests will appreciate the simple, all-in-one nature of your entire event. If you’d like to go even simpler, consider a wedding right on the beach with you, your future spouse, the officient and a few guests. Think of the memorable experience and memories you’ll create when your destination beach wedding truly takes place with your feet in the sand and the warm Melbourne beach waters caressing your ankles. Since Melbourne beach is on the East coast, a sunrise ceremony will give you a remarkably picturesque setting, while sunset ceremonies bath the entire beach in warm golden light. Working with a professional wedding planner can be one of the best ways to attain an elegant and affordable beach wedding. From helping pick the exact right location to selecting a photographer, reception location and accommodations, having someone in the know can go a long way in helping plan a wedding free of complexity. 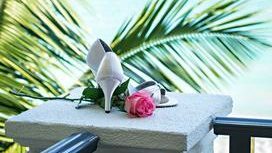 Understandably, when trying to keep a destination beach wedding simple, the temptation for the details to grow and become less simple will be there. We suggest having an open conversation with your significant other to clearly express expectations and set some guidelines for your wedding planning. No matter what, a simple destination beach wedding can be elegant, exciting and memorable.